Native & Search provides you with a new, easy-to-use Dimensions tab in the Native & Search UI that lets you view data by dimensions instantly across all accounts, campaigns and single campaigns. Reduces the number of times (i.e., frequency) you have to download your reports. 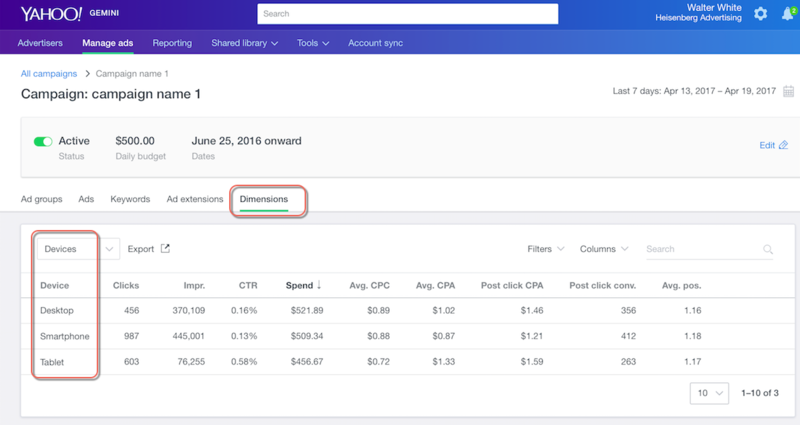 For advertisers, dimensions data is now available instantly in the Native & Search UI. Dimension reports are available for Device types, including Age, Hour, Day, as well as for Search terms. Advertisers and Account Managers can take advantage of this level of granular reporting to optimize their accounts’ and campaigns’ performance. Dimensions’ data are broken down into specific fields, like Device and Time of Day. Based on the available data, this will provide you with insights on how to modify your budgets and bids to extend reach and optimize performance.